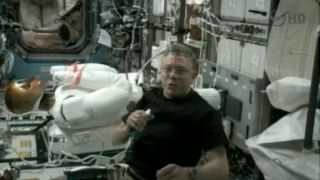 Space station astronaut Mike Fossum of NASA talks to Mission Control after working on the Robonaut 2 helper droid on the International Space Station on Aug. 22, 2011, during the robot's first tests. Move over Commander Data, there's a real robot in space, now. The International Space Station got a new crewmember today, one made not of flesh and blood, but of gears and clockwork instead. Called Robonaut 2, the automaton astronaut was activated by human spaceflyers today (Aug. 22) after months in storage since being delivered to the space station earlier this year. An initial series of tests checked the robot's power systems and camera eyes. The first view through the robot's eyes was a complicated panel of cables, dials and instruments. "Sure wish I could move my head and look around," another Robonaut 2 Twitter post read. The robot won't actually move for several more weeks, as its creators continue running tests. To be clear, Robonaut 2 cannot post Twitter updates on its own (the robot's engineering team does that under the name @AstroRobonaut). But the $2.5 million Robonaut 2, also known as R2, is designed to serve as a robot helper for the six-man crew on the space station. Robonaut 2 is the first humanoid robot ever to fly in space and was built by NASA as part of a joint project with car manufacturer General Motors. The goal is to build a robot helper suitable to assist humans in complex tasks, be they in space or on Earth, project officials have said. "He has been groveling in his stowage location over here in the lab," space station astronaut Mike Fossum of NASA told Mission Control. "The complaint's mainly been that he wants to get out and get to work. Well, today is finally the day." NASA delivered Robonaut 2 to the space station during the shuttle Discovery's final flight in February. At the time, NASA planned to leave the robot in its box, but President Barack Obama urged astronauts to set it free during a phone call to the space station. "C'mon, unpack the guy! He flew all that way and you guys aren't unpacking him?" Obama joked. The robot was ultimately unpacked in March, then put aside until it was needed. Today, space-station flight controllers at the outpost's Payload Operations Center with NASA's Marshall Space Flight Center in Huntsville, Ala., echoed President Obama's remarks as Robonaut 2 performed its first systems' checks. "We know he's glad to be out of his container," a flight controller told the space-station crew. A twin of Robonaut 2 stayed behind on Earth and can be plugged into a mobile base to wheel around different terrains. NASA will take that Earth-bound robot into the New Mexico desert next week as part of a space-exploration technology demonstration test program called DesertRATS. When fully assembled on the space station, Robonaut 2 juts out from a wall in the orbiting lab's U.S.-built Destiny module. That made the robot a hazard to other station astronauts floating by. Fossum tied pieces of bright orange tape around the robot's wrists after today's tests so he and his crewmates could see and avoid the mechanical man. "Hopefully, with a little bit of orange flagging tape there it will help remind people not to touch," Fossum radioed Mission Control. That was good news to Mission Control. The last thing anyone wants is an accident that could damage the robot, Fossum and flight controllers agreed. "You know, when he goes into motion, he'll probably act in his own self defense," Mission Control added with a laugh.